Put the cocoa and the water into a small saucepan and stir over medium heat. Gradually add in the oil and the butter. Continue stirring occasionally until it comes to a boil. Then, reduce the heat just a bit and stir for 1 more minute. Remove from the heat. Combine the flour and sugar in a large bowl. Then, slowly add in the cocoa mixture. Beat well with a mixer. Add in the buttermilk (slowly) and continue beating. Next, add the eggs one at a time. Mix well. Finally, you can pour your batter into your cupcake liners about halfway full and place them in the oven for 25-30 minutes. Use the toothpick test to see when they are ready and let them cool when done. Meanwhile, you can start on your frosting. To make the frosting, insert the butter, cocoa, and milk into a saucepan and bring to a boil while stirring for about 1 minute. 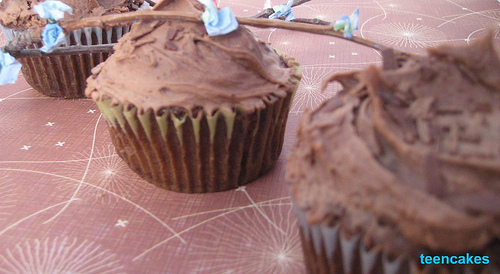 At this point, don't be discouraged by the appearance of your frosting. It's suppose to look curdled like over-beated whipped cream, or throw up. All chunky and mushy. Take the saucepan away from the heat and pour it into a large bowl. Now, gradually beat in the confectioners' sugar (about 1/2 cup at a time) and the vanilla. Continue until you've acheived a good consistency. If it becomes too thick, add more milk. Finally, frost your cakes and serve! Bon Appetit! This cupcake was pretty easy to make. The cake tasted kind of funny at first, but then I realized that the baking soda had expired. Make sure you check the expiration date on your baking soda especially because if you leave it in your cabinet for a while, it will start to soak up all of the odors around it and that will ultimately go into your cupcakes. The frosting was a keeper, though. Extremely delicious. 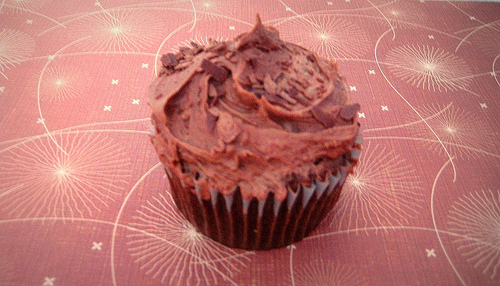 It's the type of icing that hardens like a shell very quickly, so it's like having a rich chocolate bar on top of a cupcake. I got this particular recipe from the Taste of Home magazine.